In 1883, she was bought by Callisto Legnani, Italian consul in Khartoum. For the first time she was treated with care, rather than being beaten. Two years later he took Bakhita to Italy and gave her to his friend Augusto Michieli. She became Nanny to Augusto’s daughter. While preparing to go to Sudan to run a Hotel on the Red Sea coast the Micheili’s left their daighter and Bakhita in the care of the Canossian Sisters at a convent in Venice. When the time came to travel Bakhita refused to go. During the ensuing court case, the judge concluded that since slavery was illegal in Italy, she had actually been free since 1885. Bakhita, now twenty years old, found herself in control of her own destiny. She chose to remain with the Canossian Sisters. She was baptized and confirmed in 1890, taking the name Josephine. She became a Novice in 1893 and made her profession as a Sister three years later. In 1902, she was transferred to the city of Schio, where she lived until her death. 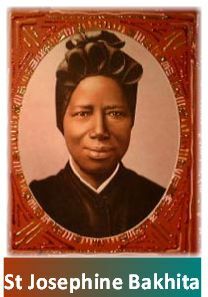 Her gentleness, calmness, and good humoured nature earned her the affectionate title of Nostra Madre Moretta (“Our Black Mother”) among the local people.